The history of the GED test indicates that there have been five series of the high school equivalency exam. The first series was created in 1942 to 1977, the second within 1978 to 1987, the third in 1988 to 2001, the fourth series in 2002 to 2013, and the fifth and most current series was initialized in 2014 and is still being implemented up to the present. The most applicable series are those that were set up in 2002 and 2014 because they concern the current generation of GED diploma holders. What Are The Major Differences Between The 2002 And The 2014 Editions Of The GED Test? In the 2002 version, the item types were composed of multiple choice, grid format, and essay questions while in the 2014 revision, test takers tackled multiple choice, fill-in-the-blank, cloze, drag and drop, extended response, short answer and hotspot items. Bloom’s Taxonomy was used for development of the 2002 GED Test whereas the Common Core Standards and the Webb’s Depth of Knowledge model does the same in the 2014 release of the exam. Boom’s Taxonomy focuses on the activity of the test-taker while Webb’s Depth of Knowledge puts emphasis on the complexity of cognitive processes, according to The Ohio State University. The fourth series of the test was administered by paper and pencil but the most recent GED series still being used up to date is taken through a computer. The price of taking the GED increased by 100% from 2002 to 2014. Test takers used to pay $60 in 2002, but in 2014, they are required to pay $120. These are some of the predominant changes in the earlier and newer versions of the GED exam as a whole. Language Arts test varies and has to be done within 3 hours, but the test takers are allowed to have a 10-minute break throughout its duration. The old GED Reading test used to feature passages with about 200 to 400 words while the new test has passages with 450 to 900 words. The text in the Reading test of the earlier GED test was mostly 75% literary, composed of prose, poetry, and drama while at present, 75% of the texts feature informational and non-fictional content and are in the context of the workplace. Poetry is not included in 2014 GED Reading test anymore, unlike in the 2002 version. The earlier series of the GED Writing test required test-takers to compose an essay about a subject, which was familiar to them and it was written on paper. On the other hand, the present series of the test requires learners to extract evidence from an informational or literary text in order to support their reflection and analysis. Because it is taken on a computer, test-takers should also have basic computer keyboard skills while arranging their essays. 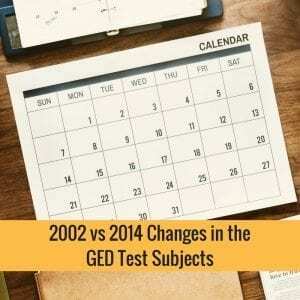 The GED Social Studies test in 2002 was made-up of 50 items of multiple choice questions with a time limit of 70 minutes but in 2014, the number of questions varies and its time limit is set to 90 minutes. In the fourth series, only multiple choice questions were featured while the present series, an extended response item is included with passages each containing about 550 to 650 words. The test was designed with 50 multiple choice items and test-takers were given 80 minutes to accomplish it. The number of question items in the test varies and this test has to be completed in 75 minutes. There were 50 items of multiple choice questions in the 2002 GED Math test, which had to be accomplished in 90 minutes. In one of the couples of sections in the test, test-takers were allowed to use the Casio fx-260 Solar Scientific calculator and they were given a sheet that contained a list of commonly-used formulas. In the 2014 GED Math test, the number of test questions varies and the set time limit is 75 minutes. On-screen, candidates can access a Texas Instruments TI-30XS Scientific calculator along with a calculator reference tool and they can click to be able to view a formula sheet. The workforce and education landscapes have changed for over a decade since 2002, that’s why the GED test was revised in 2014. Many candidates claimed that the GED test has become more difficult and the standards for passing are now more stringent. Times may have changed especially as statistics has predicted that by 2024, 75% of jobs are bound to require more qualifications than a high school credential. Whatever the case may be, it is recommended for candidates to use a complete GED test prep program with updated GED practice tests and online classes in order to pass it with flying colors and be a step closer to their academic and career goals.